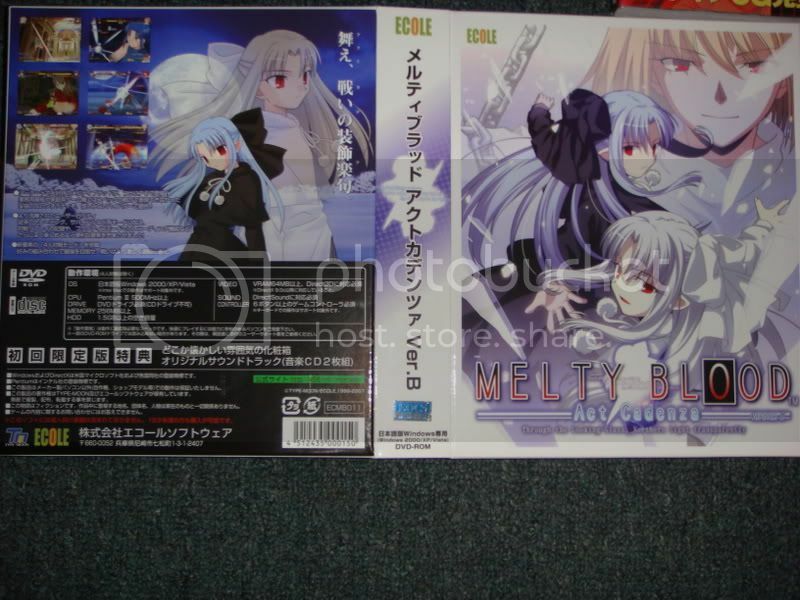 Having been introduced to the game from bootleg copies, I have been trying desperately to get copies of original Melty Blood and MBR off the interwebs, but as most online stores have completely dumped their inventory for Act Cadenza vB, that leaves eBay, conventions, and any possible acquaintances that live in Japan. I am already aware of the general "rules" of spotting a bootleg (There is no DVD version of either game, both games are separate and can only be found separate, etc) but I fail to believe that bootleggers use exclusively DVD-ROMs with both games. 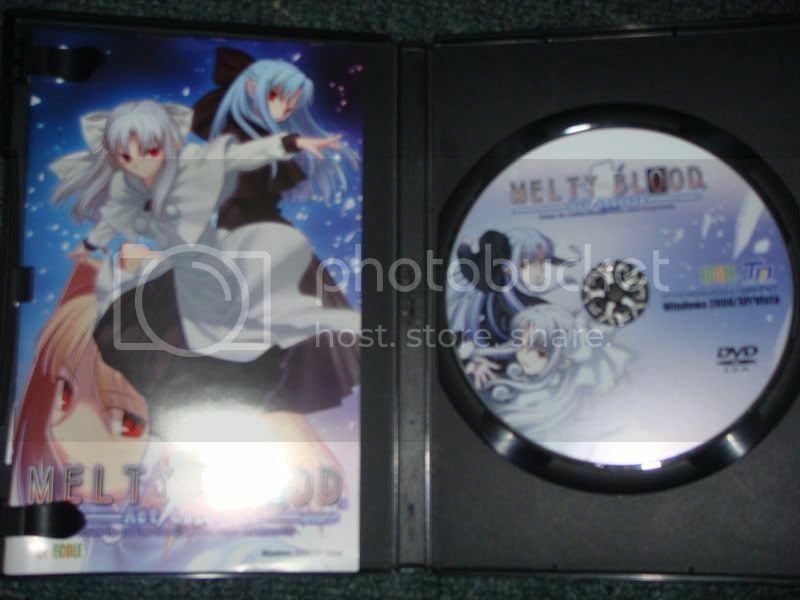 Is there any pictures of authentic TYPE-MOON Melty Blood/MB ReACT discs/cases for those of us looking to buy the authentic copies, so that we don't get duped by folks making a quick buck off of pirated gear? I'll post up what the MB AC Ver.B looks like once I get my net up to broadband speed again (the 19th apparently). If anyone could post it earlier, then feel free. My version's the Limited Edition though. -[J1N]- wrote: I'll post up what the MB AC Ver.B looks like once I get my net up to broadband speed again (the 19th apparently). If anyone could post it earlier, then feel free. My version's the Limited Edition though. What's the difference between the regular, and the Limited Edition??? Actually I'd like to know that myself. What I think is that the Limited Edition box is a little larger, to contain the game and the OST. Err, yeah, and there's the existence of the OST in the LE box too. Oh oke, so you get the OST as well. That's nice. There are some cool songs on that. Thanks for the info. Ok, I finally got to upload the photos of the game. Sorry the quality's pretty poor, but it's good enough to give you an idea on what it looks like. I wish this topic came earlier. 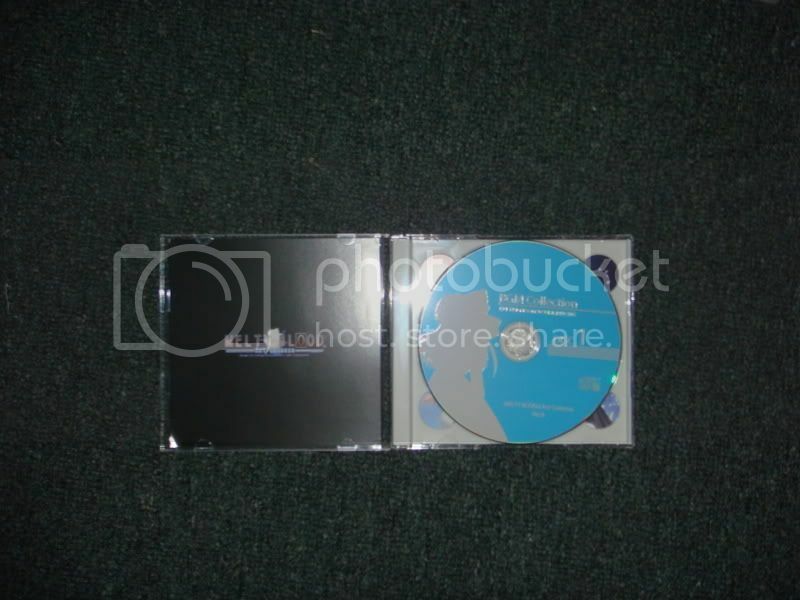 I bought Melty Blood along with ReAct, only to find out it was bootlegged. Although the guy did make a lot of work out of it, ReAct failed to work. But hey, I have Melty Blood itself gotten to work, so not all was lost. I wish I could make a picture of it, but my camera's busted.